The Nelson Region is home to some really fantastic walking opportunities, though they often don’t make it into the guides you see online. But this doesn’t mean they aren’t worth doing! In fact, some of these ideas are very much considered ‘local’ recreation. This means that you get to enjoy a really authentic New Zealand experience. The Cable Bay Walking Track is definitely one that you should add to your list. It’s a pretty demanding climb, but well worth the effort for the spectacular coastal views! 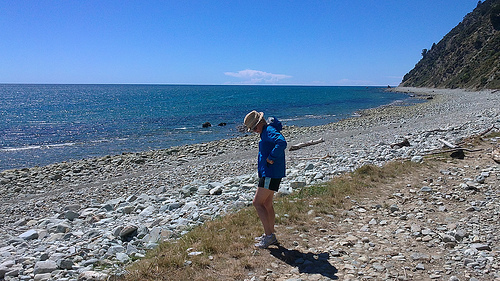 The Cable Bay walking track is a predominantly hilly hike over the coastline between Cable Bay and the township of Glenduan, which is 23km north of Nelson. This walkway is 8km long, and can be completed in either direction. It will take someone of an average fitness level about 3 1/2 hours one-way. There is also the option of doing the smaller Glenduan Lookout Loop, which takes about 2 hours. 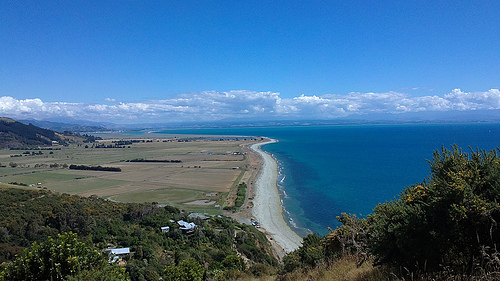 The reason why this walk is so spectacular is its location; spanning the right-hand side of the Tasman, good weather will give you spectacular views across the Bay. During the walk, you’ll get to enjoy the stunning vistas of the Abel Tasman and Kahurangi National Parks, and well as Nelson city. 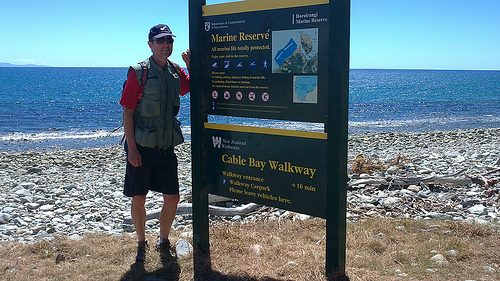 Note: The Cable Bay walking track is not open all year-round. Parts of the track pass through private farmland, which gets closed off for lambing between August and October. It’s important to remember at any time of year that this is working farmland. This means following a one basic rule: leave everything exactly as you found it. It’s also worth checking the Department of Conservation website for any alerts such as fire danger before heading out. When it came to our visit to the area, Michael just said “Let’s do the Cable Bay Walk.” “Ok.” I was my response, and it was a done deal. As I tried to keep traction on the steep hill climb, I remembered what I said and marvelled at my dumb acceptance! Why didn’t I pose a few pertinent questions, like “what grade is this walk”? and “will there be a lot of climbing?” It’s always a good idea before you set out to check the terrain of the walk before you head out. After all, there is a pretty big difference between 10mn on the flat and 10km up a hill! Make sure that you bring some sturdy footwear for Cable Bay, too. 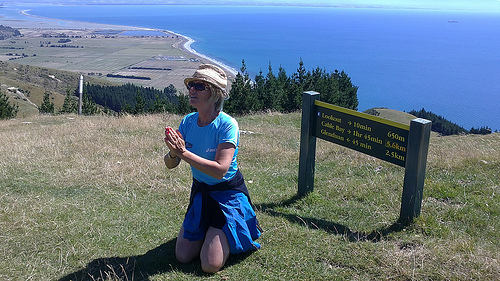 It’s a common sight in New Zealand to see tourists trying to do some pretty hefty hikes in just a pair of tennis shoes! If you end up slipping and giving yourself in injury, it could put a serious dent in your holiday plans. As always with travelling, it’s better to be safe than sorry! The view looking out over the sea is stunning. Unlike some of the water around the Tasman area which is more of a green-turquoise, this is the deepest hue of blue. After leaving the carpark we stroll along a country road. The cicadas are singing and the bellbirds are hitting the high ‘C’s’. One of the best things about these birds is how plain they are. They look like little sparrows – it’s their beautiful voice that makes them stand out! 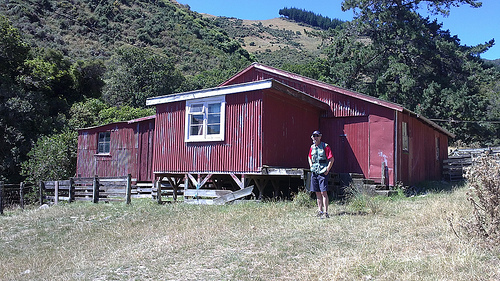 We arrive at the start of the Cable Bay track, where an old red tin barn is conveniently located for a photograph. Michael loves this bit of Kiwiana. These barns really speak of New Zealand’s rural farming heritage. We both stop to whip out the camera. This is probably a meaningless exercise to some, but one day these old barns will be gone. Happy thoughts are back again! The descent is wonderful. We come across some fearless livestock – mildly offended that we humans have interrupted their day. No need to worry though, they’re curious animals, but very used to humans. Mostly likely, they will ignore you. 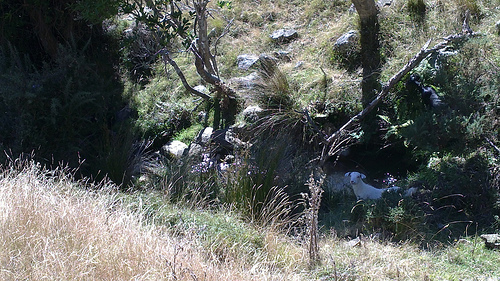 Don’t you just love this little goat lurking in the undergrowth? Although I’ve whinged a bit about the Cable Bay Walkway, don’t let that put you off. It’s important that you have a good level of fitness if you want to do this walk. Start the climbing part of the loop first, and take stops on the way to enjoy the beauty. My hips are killing me, and I’m a little surprised to see Michael rubbing his own rump – seems we’re ALL getting on a bit! Time to pop the cork, kick back and watch the frost forming on the glass! 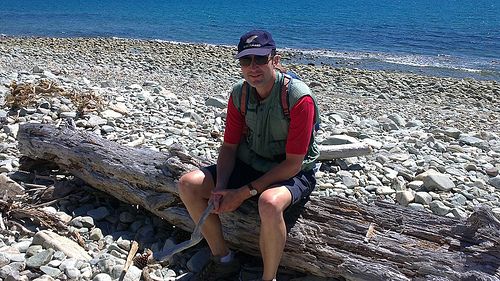 For some walks in the wider Nelson area, check out our specialist post on the subject. You can check out our specialist nature and lifestyle itineraries here.